Thomas needs 5-on-5 practice reps, which he won't get with the Cavs. 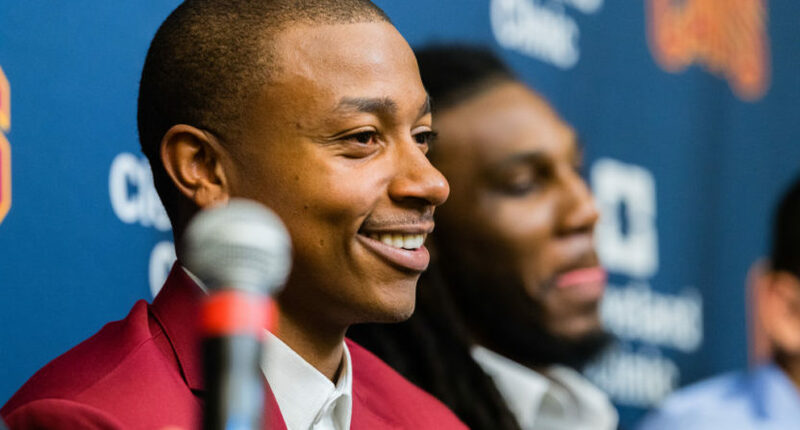 The Cleveland Cavaliers are hoping to get prized offseason acquisition Isaiah Thomas on the court at some point soon. But first, he needs to be able to get caught up to speed after recovering from his hip injury with some practice. To help Thomas prepare for a return to NBA action and a subsequent playoff run, the Cavs are sending Thomas to their G League affiliate in Canton to get in some five-on-five practices. ASSIGNMENT: we have assigned guard Isaiah Thomas and center Ante Zizic to the @CantonCharge today. Thomas is on assignment in order to officially participate in the Charge full-team practice. As noted by the Cavs beat, this does not mean Thomas is going to be playing any games in the NBA’s developmental league, although that possibility could be in the cards to get Thomas some playing time against live opposition to replace time lost in the preseason. But the likely scenario is making sure Thomas is healthy enough in five-on-five practices to jump back up to the big-league club. Because the Cavs do not run their practices with a full five-on-five practice, the only way to get Thomas those kinds of practice reps is to get him on the practice court with the team’s G League affiliate, the Canton Charge. Thomas is recovering from a torn labrum in his hip suffered back in March while playing with the Boston Celtics. The star point guard was acquired by the Cavs in the deal that sent Kyrie Irving to Boston in the offseason. Thomas returned from the injury while with the Celtics, but reaggravated the injury during the Eastern Conference Finals against the Cavs last postseason. He has yet to play a game for the Cavs this season, which may be one reason why the team is currently third in the Eastern Conference going into Thursday night’s play. The Cavs and Thomas are eyeing a return after the holidays, with a possible return date of Jan. 3 against the Celtics sitting right there to make for a fitting narrative.